Oceans 999 is ready to celebrate Dine Out Vancouver. 2018 marks the 20th year of this 17-day festival of delicious events that provide locals and visitors alike with unique culinary experiences. 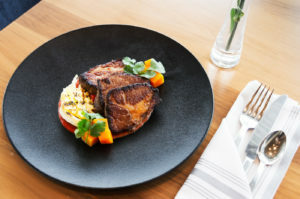 We were lucky enough to track down Chef Brody Paine who has created this year’s Dine Out menu for the Pan Pacific Vancouver’s – Oceans 999 Restaurant. A man with a lifelong passion for the culinary arts, Chef Brody followed his love across Italy to discover, first hand, the intricacies of authentic European cuisine. 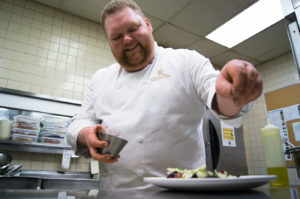 Chef Brody loves having the freedom to experiment with dishes and his talents earned him his position as Chef for Team USA during the 2006 Turin Olympics. 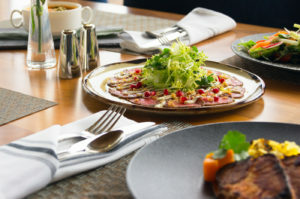 Chef Brody and the Oceans 999 team have designed a mouthwatering menu featuring locally sourced and seasonal ingredients, uniquely combined to create an unforgettable fusion of Westcoast/European tastes, textures and aromas. 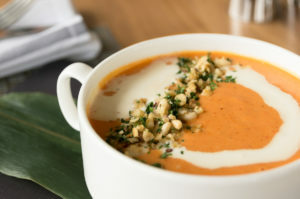 Kabocha Squash Soup – A Japanese style squash soup with hints of ginger, coconut, and miso, topped off with a delicate sprinkling of cashew crumbs. With squash in season, this vegan dish is a must try. 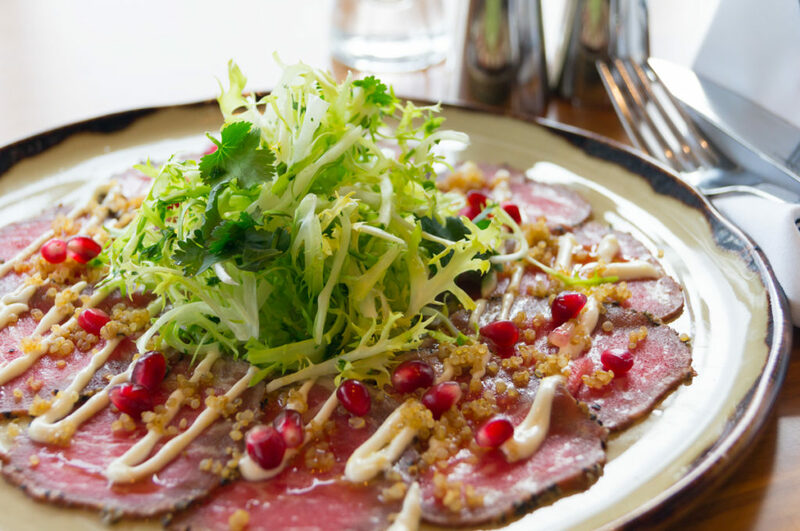 Alberta Prime Beef Carpaccio – Chef Brody has added a Moroccan twist to traditional carpaccio, then partnered it with a tangy tahini dressing and quinoa herb salad, accented with pomegranate seeds. 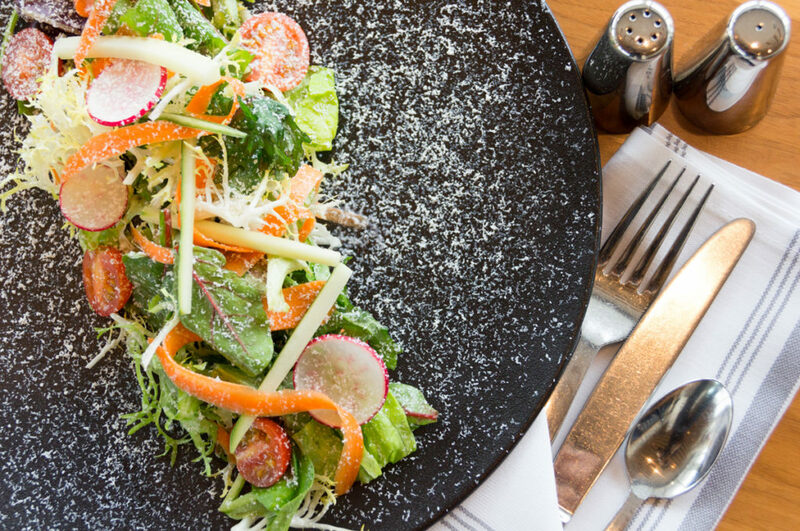 Pan Pacific Organic Greens Salad –fresh Barnston Island greens, frisée, pickled carrot and cucumber, grape tomatoes, with locally produced goat cheese snow sprinkled on-top with ice wine vinaigrette. Beef Short Ribs – Exclusive to Dine Out Vancouver. Marinated in a Spanish marinade called “Adobo”, and slow cooked for 36 hours, this melt in the mouth dish brings back memories of Spain. It is paired with Star Anise pickled butternut squash, charred cabbage, cilantro, and Romesco sauce. 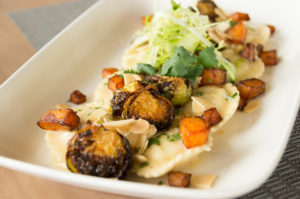 House Made Fraser Valley Butternut Squash & Herb Ravioli – House made paste with fresh farm-to-table roasted butternut squash, crispy Brussels sprouts, toasted almonds, and brown butter drizzled on top. A truly unique dish you won’t find anywhere else. The Dine Out Vancouver Festival runs for 17 days, starting January 19th. 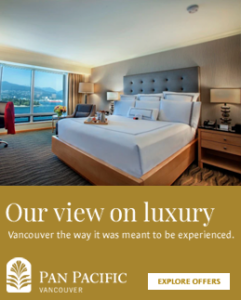 To make sure you don’t miss out, click here or call us at +1 604 895 2480 to book your Dine Out Vancouver experience.